The term postcentral gyrus refers to the convolution of cerebral cortex immediately caudal to the central sulcus, which separates it from the precentral gyrus in humans ( Carpenter-1983 ) and macaques ( Martin-2000 ). Defined by dissection, it is located at the rostral extreme of the parietal lobe. In the human it is bounded caudally by the superior parietal lobule dorsally and the supramarginal gyrus of the inferior parietal lobule ventrally. It is separated from those structures on the lateral surface of the hemisphere by the postcentral sulcus, which in about half of cases is a discontinuous sulcus with two or three segments ( Ono-1990 ). On the mesial surface of the hemisphere it is bounded rostrally by extrapolation of the central sulcus across the dorsal margin onto the mesial surface and caudally by extrapolation of the postcentral sulcus onto the mesial surface; it is separated from the cingulate gyrus by the cingulate sulcus. Ventrally on the lateral surface it is separated from the superior temporal gyrus by the lateral fissure. It forms a lip over the insula known as the parietal operculum. A short branch of the fissure, the posterior subcentral sulcus projects into the operculum. The boundaries in the macaque are similar except that the caudal border is only partially defined on the dorsal surface by a short postcentral sulcus ( Martin-2000 ). 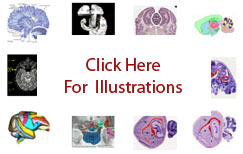 Equivalent structures are not found in the smooth cerebral cortex of the rat or mouse.